NASA astronaut Steve Swanson on a spacewalk outside International Space Station on April 22, 2014. NASA has postponed a pair of spacewalks this month for astronauts on the International Space Station in order to replace batteries on the U.S.-built spacesuits that will be used on the excursions. The space station's current commander Steve Swanson and flight engineer Reid Wiseman, both NASA astronauts, had been preparing for their spacewalks, scheduled for Aug. 21 and 29. The spacewalks are now expected to occur no earlier than this fall, according to NASA officials. 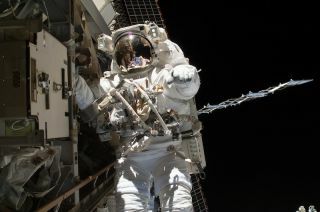 But space station managers decided this week to put this month's spacewalks on hold because of "a potential issue with a fuse within the battery of the U.S. spacesuits," according to a statement from NASA. Two unoccupied NASA spacesuits appear to carry a storage bag on the International Space Station in this photo by an Expedition 40 crewmember released on Aug. 8, 2014. A new set of long-life batteries will be delivered to the astronaut outpost inside of a robotic SpaceX Dragon capsule as part of the California-based company's next delivery to the space station, currently scheduled to launch Sept. 12. The flight will be the fourth of 12 unmanned cargo missions to the space station as part of a $1.6 billion deal SpaceX has with NASA. SpaceX's last Dragon delivery arrived at the space station on Easter. The delay in the spacewalks won't affect any daily operations of the station, NASA officials said. But it likely means Swanson won't be participating in any more ventures into the vacuum of space during stay aboard the station; he is scheduled to return to Earth on Sept. 10 on a Soyuz capsule with Russian cosmonauts Alexander Skvortsov and Oleg Artemyev. Skvortsov and Artemyev, meanwhile, will go ahead with their spacewalk planned for this month. On Aug. 18, the Russian flight engineers will go outside the lab to deploy a nanosatellite, install two experiments and retrieve three other experiments. Wiseman, Swanson, Skvortsov, Artemyev are four of the six members of Expedition 40 currently living and working on board the $100 billion lab. German astronaut Alexander Gerst of the European Space Agency and cosmonaut Maxim Suraev round out the rest of the crew.